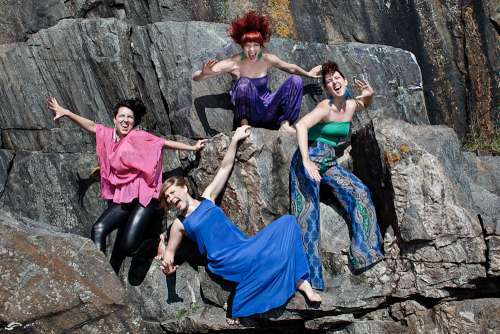 Tuuletar are a vocal ensemble of four women who have skyrocketed to international fame in recent years. Although their music is firmly anchored in the soil of folk music, they seek to avoid being boxed or categorised, preferring instead to interpret tradition liberally. Combining folk-oriented a cappella expression with beatboxing, Tuuletar [the name might be rendered as ‘Maiden of the wind’] describe their music as vocal folk hop, drawing not only on the Finnish tradition but also on a wide range of pop music and world music influences. Venla Ilona Blom, Sini Koskelainen, Johanna Kyykoski and Piia Säilynoja say emphatically that they are above all a band; they just happen to use their voices as instruments. Their music is created only using the human voice; they use electronics to layer the sound and to produce effects. The rich diversity of their music stems from four musicians interested in different kinds of music joining forces around a common core of Finnish folk music. The four women first met while they were all exchange students in Denmark. Absence makes the heart grow fonder, and Finnish folk music began to exert a powerful pull on them. Making folk music together ignited a spark that has never dimmed since. “We booked our first gig before we had written any pieces of our own,” says Johanna Kyykoski with amusement. The singers of Tuuletar are university-trained rhythm music professionals with serious chops in world music, improvisation and voice pedagogy. But they are not dyed-in-the-wool folk musicians, nor have they undergone academic folk music training. They share a strong interest in the Finnish tradition, and they have learned by doing, fired by their enthusiasm. They work on an egalitarian and liberal basis, writing pieces together and swapping roles as required. Today, they also write their own lyrics, in the spirit of the poems of the Kanteletar, the folk poetry collection that was an early source of inspiration. “We don’t want to pigeon-hole ourselves, because we have so many aspects, routes, passions and inspirations to explore. Boundaries choke creativity,” says Venla Ilona Blom, the band’s beatboxer. This interview follows a hectic day of performances at three schools in Espoo. School concerts are an important part of what Tuuletar do in Finland. Their agenda is to show children and adolescents just how diverse folk music can be. “The schoolkids are always stunned when Venla begins to beatbox,” says Sini Koskelainen, laughing. “After a school concert we might get someone coming up to us and asking where they could get a copy of the Kalevala. If we can get even just one kid excited about the tradition by presenting it in a new light, it’s an important achievement,” says Venla Ilona Blom. For all of the influences that go into them, the songs of Tuuletar depend on the basic building blocks of folk music: text, rhythm, simple melodies and repetition. And the Finnish natural environment, of course. “We want to express powerful, deep emotions,” explains Johanna Kyykoski. The band is convinced that folk poetry and music can speak directly to people today. On their newest, rap-styled single titled Uho [Bravado], Tuuletar tackle modern hate speech through the ancient tradition of hyperbolic bluster. Tuuletar photographed by Maria Baranova. At Finland’s first Ethno-Gala in autumn 2017, Tuuletar were nominated for Folk Music Actor of the Year. But Tuuletar have been attracting even more fans abroad than at home. Their album Tules maas vedes taivaal [In fire, on earth, in water, in the sky], released in summer 2016, lodged in the Top Ten of World Music Charts Europe for months. In October 2017, Tuuletar went on an extensive tour of Taiwan, and early in 2018 they performed at the Sur Jahan Festival in India. Tuuletar's UK début is up next. The prestigious Songlines Magazine invited them to perform at their annual Songlines Encounters Festival on 1 June. The band will soon return to the UK, as the WOMAD festival selected them to appear at a concert on the festival stage in Charlton Park, Wiltshire on 28 July. In addition to the UK and Finland, Tuuletar will also appear in Sweden, Estonia and Switzerland in summer and autumn this year. “The tradition is there for everyone, and anyone can interpret it in any way they wish. We are getting so much out of Finnish folk tradition as fuel for our own music. If someone decides that it’s not folk music any more, then so be it!” says Blom. Tuuletar would like to see new folk music gain a higher profile without being trapped in the box of folk music. They would also like it to be performed far and wide so that it would also be heard by people who are not specifically out to look for folk music. This article was first published in Rondo Classics magazine 12/2017. Finest World Sounds at Shibuya WWW in Tokyo on Wed 23 May, 2018 features Tuuletar as well as Antti Paalanen, Maija Kauhanen, Mari Kalkun and Curly Strings.